It’s no secret that I’m a lover of all things tech. 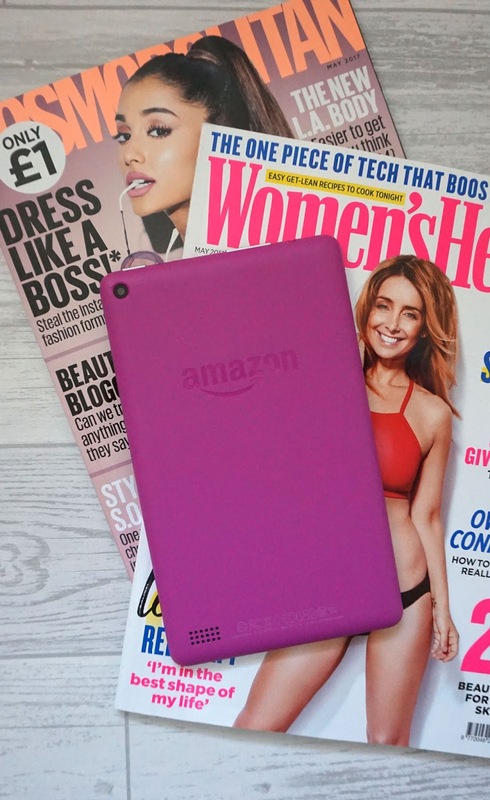 You name it, I’ve had/got it: laptops, tablets, e-readers, smart phones, smart watches, fitness trackers, game consoles etc etc, but only recently did I become acquainted with Amazon’s tech offering when I finally got a Kindle last year. I’d always said I’d never have one as I always prefer to hold a real book, but after years of coming far too close to the suitcase kilo limit with my 6 paperbacks carefully stashed in there, I figured I needed to get with the times and save that valuable case space! Then fast forward a year to a few weeks ago when I received the new Fire Tablet 7″ in a gorgeously bright magenta shade, and I can firmly say I’m loving Amazon’s tech offerings. Now, like I said, I’m fairly new to the Amazon Fire game having only had this a few weeks, so this is more of a ‘first impressions’ post rather than a full blown review, as there’s so much you can do on this that I simply haven’t got round to trying, but I can say so far that those first impressions are pretty good! First things first, let’s start with how it looks and feels! The Amazon Fire is what I’d class as a more affordable tablet than say, an iPad, so for the £49.99 I think you get something that is durable and great quality. Amazon actually boast that it is 1.8 times more durable than the iPad Air 2, and I can see why. I haven’t tried dropping it (and don’t intend to!) but I can’t imagine any damage happening to it if I did, which I think would make this a great device for families who have young children. 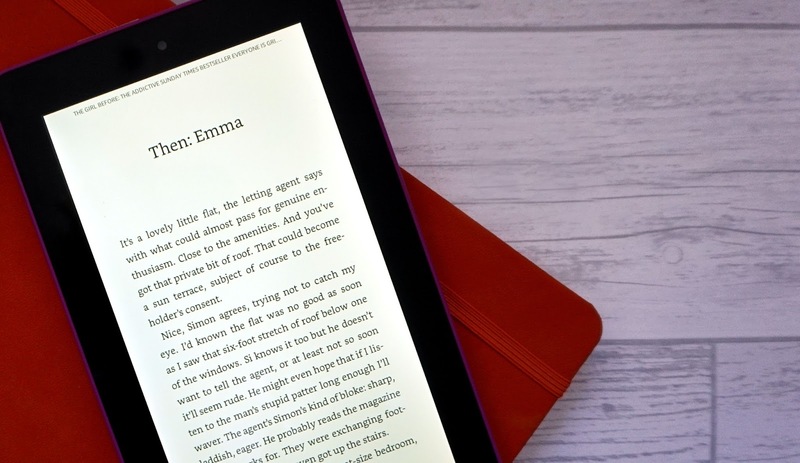 It’s a great portable size and fits perfectly in my handbag for those long train commutes, and shape and design wise, it isn’t too far removed from the Kindle e-readers in terms of materials and weight. The glass 7 inch screen is durable and clear, though can appear a little pixelated when examined closely, but for the cost I think it’s pretty decent. I also love the fact you can choose from three new colours which make it look a lot more fun and exciting than your regular tablet, giving it a little more personality and making it stand out from the crowd. You can choose from blue, magenta or tangerine as well as the classic black version, at no extra cost. Now admittedly so far I’ve only really used this for reading, playing a few games and perusing the internet, but so far, so good. 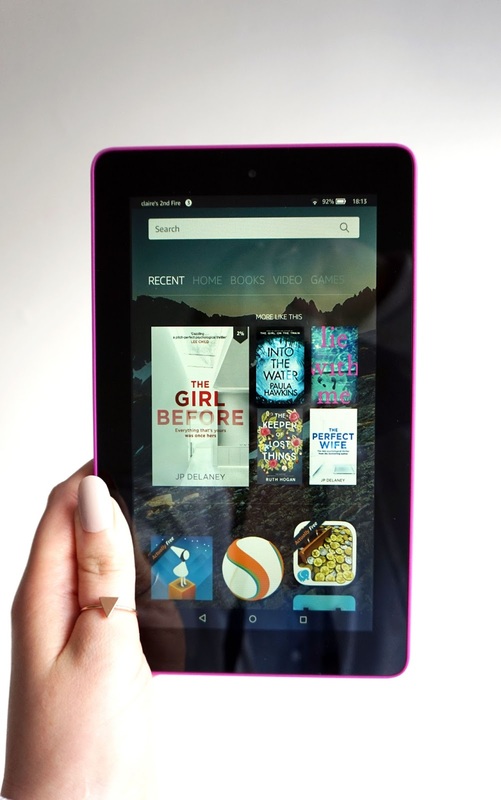 The Amazon Fire Tablet comes pre-loaded with numerous Amazon applications such as the Appstore, Video, Music, Kindle Books, Audible and it’s own internet browser, Silk, to name a few. At first, this can feel a little overwhelming as there’s a hell of a lot of stuff to scroll through on the home screen, and so far I haven’t found a way to customise the layout, but once you start to use the apps you like, I found that swiping to the ‘Recent’ page was a much quicker way to find my favourites. I’ve found everything to run pretty smoothly and quickly, and there’s plenty available to download in the Appstore from games and photo editing to apps for productivity. 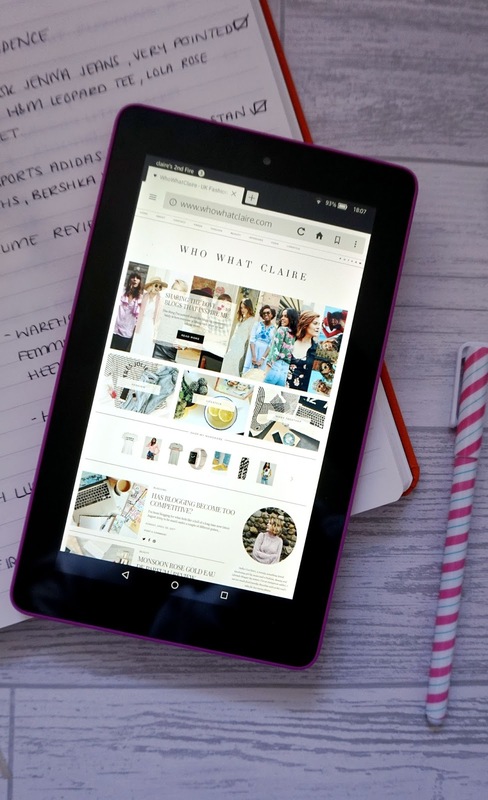 If you’ve used a tablet or smartphone before than you’ll find this really easy to get to grips with! This isn’t the fastest tablet I’ve ever used, but its far from being the slowest. I’ve found it to load apps fairly quickly, with only the occasional lagging in a couple of the games that I’ve been playing. The Silk browser isn’t as powerful as other more well known browsers such as Chrome or Apple’s Safari, with image heavy sites taking longer to load than they would on these, but it does the job. Loading books can understandably take a while with the sheer size of them, but reading the books themselves is a pretty seamless experience, and to be honest I’d expect nothing less from the makers of the Kindle! Personally I don’t think the camera is great which is a shame. As a blogger, I’m always snapping photos and I’m always after the highest quality shots I can get. For me, its 2 megapixel camera doesn’t really deliver, but then again, I tend to take photos on either my phone or camera, so it’s not a huge deal. One thing that has impressed me though is the battery life. I’ve been getting around 3-4 days out of this and that’s with regular game playing, web browsing and reading each day. All in all I’m pretty impressed with the Fire Tablet. It’s not the best one on the market, that’s for sure, but it’s amazing for its price and would be brilliant for someone who wants to try a tablet for the first time, or for someone who wants one for occasional use. It would also be a great first-tablet for children, especially with its bright colours! I’m definitely going to get a lot of use out of mine, especially to keep me entertained on my weekly train journeys around the UK for work. I’m looking forward to playing around with more of the apps and getting to know my way round more of the Amazon software! 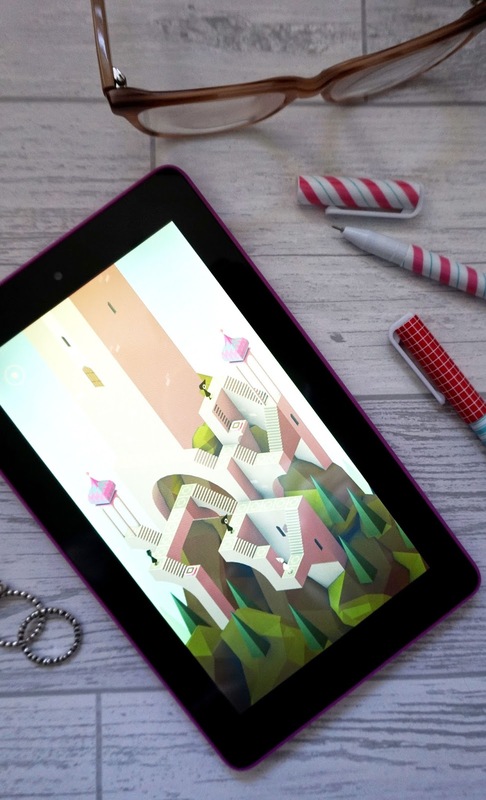 Have you used an Amazon tablet before? What are your thoughts? *The Amazon Fire Tablet was gifted to me by Amazon, however all thoughts are my own and 100% honest. "PRIMARK PS PRO KISS PROOF LIQUID MATTE LIPSTICK | REVIEW"